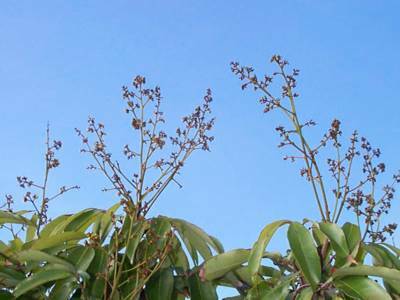 Flowers, in particular the female flower, is the predecessor to a lychee fruit. When the ovary of a female flower comes into contact with pollen from male flowers an embryo will develop into a lychee fruit, provided pollination is successful. Most lychee varieties do not flower or fruit consistently every year and others, especially the non-commercial varieties, may go many years without producing much fruit. Flowering in lychee trees occurs once a year in the winter and happens during one growth cycle in the year round continuous growing process. 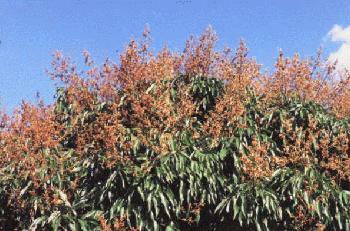 Lychee trees must flower, pollinate and fully complete fertilization during this cycle for there to be fruit set. Understanding this process is a key factor in managing lychees for optimal fruit production. Lychees grow in "recurrent terminal flushes", which means that they grow from the end of branches in periodic spurts separated by short intervals of dormancy. Young lychee trees flush as many as 5-6 or more times a year whereas mature fruit bearing trees flush several times a year with a bloom flush in the winter. The interval of dormancy between successive flushes is 6 weeks minimum and can be much longer depending on the tree size, age, weather conditions, growing conditions and variety, etc.